All the big ASIC miners I have had over the years have been between 500w and 800w. It seem to be an ongoing trend for one reason or another that they fall into this bracket and I am sure it will continue. The first this we need to be aware of is can our circuit handle the amount of miners we are going to put on it. I employed a contract electrician to come and check my wiring and fuse box, he recommended I add a new circuit breaker to the power board rated at 30Amp and run a new ring just to cover the miners. This will isolate the miners from the rest of the house. The wife would have been extremely annoyed at me if the miners had tripped the standard house wall sockets and she couldn’t dry her hair or something. 13A Per socket, so 13×240 = 3120 Watts. If we have some Bitmain L3+ miners at 800watt we can only put 3 on a 13Amp surge protected gang plug. 30A Breaker, so 30×240 = 7200 Watts. Each L3+ costs me approx. £70 a month to run. As I have a British Gas smart meter I can verify that this is true. 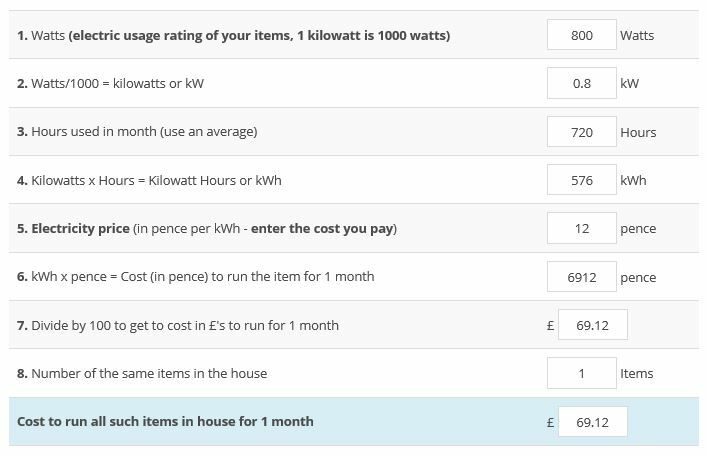 I have to take this into account when planning to pay for my electricity bill each month. DO NOT get caught out as I once did and ended up with an unexpected £1800 bill.